Moving forward, down your street, you see a Church; besides your residential house lies a Mosque. At the workplace, you have a friend that works with a Non – Governmental Organization in the adjoining office space to yours or your father that belongs to your community landlord and Landlady Association. Then you begin to wonder about the legal implication of the Church, Mosque, NGO, and Association, most, if not all, are registered as an Incorporated Trustee popularly known as “IT”. The law is that where any person or persons appointed by any community, association, educational, charitable or religious organization, social, development or cultural association, such person(s) must apply to the Corporate Affairs Commission as a corporate body. That corporate body is known as “Incorporated Trustee”. I will highlight the various steps to register your Incorporated Trustee with ease. For ease, it is advisable that you select two names. Must not be a convicted person. Contact details i.e. phone numbers, email, etc. Means of identification i.e. permanent voter card, international passport, driver’s license, national identity card, etc. Complete your application for registration by filing all the relevant information you collected from your trustees. Two newspaper notices (national and local dailies) where names, objectives and address of the trustees were advertised for possible objection(s) from the public. Copies of the constitution duly signed by Chairman and Secretary and impressed with the Iron Common Seal of the Trustee. Note the entire process may take a minimum of 35 days and a maximum of 60 days depending on availability of information and efficiency. This is very crucial and important as your solicitor is able to deal with the legal technicalities of name search, formulating objectives of your incorporated trustee; and render spot-on legal advice on the registration process from beginning to the end. 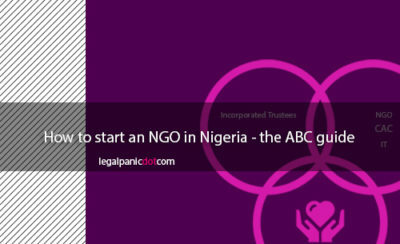 I am glad you now know how to start an NGO in Nigeria or any other IT (Incorporated Trustee) registration.